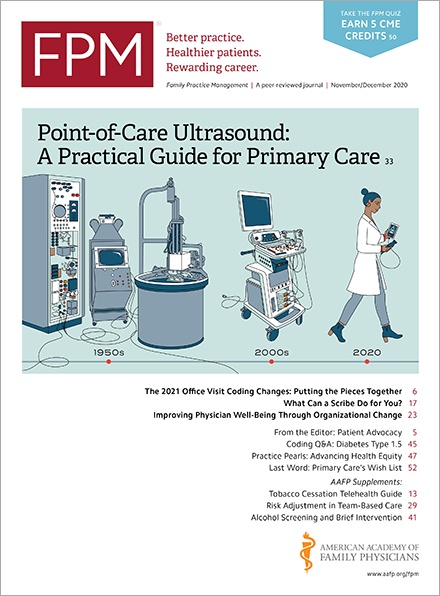 Family physicians spent much of 2014 wrestling with the seismic changes affecting medicine across the United States and in their practices. That won’t slow down in 2015. “The coming year will again be one of major transition for the U.S. healthcare system,” said Lou Goodman, PhD, president of The Physicians Foundation and chief executive officer of the Texas Medical Association, in a statement announcing the Foundation’s “Physician Watch List for 2013.” The list, based on the Foundation’s own research, policy papers, and physician surveys, identifies the five issues most likely to affect physicians and their patients this year. 1. Accelerating consolidation. Hospitals and health systems are buying up small practices and absorbing solo physicians at a faster pace. Besides affecting local competition, costs, and patient choice, the trend has physicians worried about clinical autonomy. The Foundation’s 2014 Biennial Physician Survey(www.physiciansfoundation.org) found that 69 percent of those participating said they had concerns about autonomy and being able to make the best decisions for their patients. It said that as the consolidation isn’t expected to slow down, hospitals and physicians must work together to prevent bureaucracy or other organizational factors from influencing medical decision-making. 2. The physician-patient relationship is stressed. The increased documentation of value-based reimbursement systems and perceived interference of health care employers are considered key external pressures on the relationship between patients and their physicians. In particular, physicians have told the Foundation that these factors are eating into their face-to-face interactions with patients while also limiting their choices of practice types and requiring more time spent negotiating with payers and vendors. These pressures will call for more reliance on practice support staff to help the physician retain as much focus on the patients as possible. 3. ICD-10 finally arrives. Physicians were given a one-year reprieve when the Centers for Medicare & Medicaid Services (CMS) postponed the implementation date for the new ICD-10 coding structure to Oct. 1, 2015. But the extra time likely won’t improve many physicians’ outlook or support. According to the Foundation’s survey, half of respondents expected ICD-10 to cause severe administrative problems in their practices and three-quarters said it will unnecessarily complicate coding. Still, it’s highly unlikely CMS will delay ICD-10 again, so practices need to make the necessary investment of time and money to be ready for the change. 4. Patients demanding the true cost of care. Medical costs were once a hidden algebra to the public, deciphered only by payers and health care administrators. But media focus in recent years(time.com) on the lack of transparency in billing practices, as well as higher out-of-pocket costs for patients, has the public much more frustrated. The seeming arbitrariness of what certain procedures actually cost stands to make it harder for physicians to make the best clinical decisions and calls for policymakers, providers, and payers to build a more straightforward cost of care structure. 5. Patient access to care. As more people are gaining access to health insurance through the Affordable Care Act and demanding health care services, the overall number of physicians is declining or reducing the amount of time available to see patients. According to the Foundation, 44 percent of respondents in its survey said they were planning to reduce access to their services, such as shrinking their panels, retiring, going to part-time work, or taking non-clinical jobs. This could reduce patient access to care by tens of thousands of full-time equivalents (FTEs) in the future. The Foundation, along with the University of North Carolina-Chapel Hill, has developed a tool(www.physiciansfoundation.org) to help analysts and lawmakers to better gauge future shortages of physicians.